Daryl Murphy scored late on as Ipswich came from behind to beat Huddersfield. James Vaughan missed a penalty but Huddersfield took the lead in the first half when Danny Ward finished from Adam Hammill's cross. Ipswich equalised early in the second half courtesy of David McGoldrick's left-footed finish. The hosts then secured all three points when Murphy headed in during the final minute to make it three wins from three for Ipswich. They move up to ninth in the Championship with 29 points, two off the play-off places. Huddersfield, meanwhile, are 11th with 26 points. The visitors had arrived at Portman Road looking for their fourth successive win and it was a confident start by Mark Robins' men. Oliver Norwood shot over before Ward forced Ipswich keeper Dean Gerken into a smart save. Huddersfield should have been ahead midway through the first half when Christophe Berra brought down Vaughan inside the area, but the striker's spot kick was saved by Gerken. However, 10 minutes before the break, they were ahead when Hammill broke to the by-line and crossed for Ward to finish. Hammill then smashed a shot against the underside of the bar as Huddersfield pressed for a second, but Ipswich levelled soon after the restart when McGoldrick was picked out inside the area by Cole Skuse's fine ball and he made no mistake. Huddersfield substitute Sean Scannell had a shot deflected wide but the game looked to be heading for a draw before Murphy headed in from Aaron Cresswell's free kick. Ipswich manager Mick McCarthy: "I thought it was a great result and a fair one. "It was a bit touch-and-go either way. I didn't think it was a penalty in the first half - so James Vaughan got his just desserts. "But we showed a great response to their goal and we have a great spirit at the club. People care about their mates, the team and the club." Huddersfield manager Mark Robins: "The Championship is full of diverse teams who offer different things, but we coped with what Ipswich offered. "We could have been 3-0 up at half-time and it wouldn't have been embarrassing. "But we lost because we gave the ball away, the referee gave them two chances at the free-kick and we didn't pick them up." Match ends, Ipswich Town 2, Huddersfield Town 1. Second Half ends, Ipswich Town 2, Huddersfield Town 1. Offside, Ipswich Town. Jay Tabb tries a through ball, but Daryl Murphy is caught offside. Substitution, Ipswich Town. Tyrone Mings replaces David McGoldrick. Substitution, Huddersfield Town. Duane Holmes replaces Jonathan Hogg. Adam Clayton (Huddersfield Town) wins a free kick in the defensive half. Goal! Ipswich Town 2, Huddersfield Town 1. Daryl Murphy (Ipswich Town) header from the centre of the box to the bottom left corner following a set piece situation. Adam Hammill (Huddersfield Town) wins a free kick on the left wing. Offside, Ipswich Town. Daryl Murphy tries a through ball, but Jordan Graham is caught offside. Substitution, Ipswich Town. Jordan Graham replaces Frank Nouble. Offside, Huddersfield Town. Adam Clayton tries a through ball, but James Vaughan is caught offside. Attempt blocked. Oliver Norwood (Huddersfield Town) right footed shot from outside the box is blocked. Assisted by Jonathan Hogg. Corner, Huddersfield Town. Conceded by Ryan Tunnicliffe. Delay in match Anthony Gerrard (Huddersfield Town) because of an injury. Attempt missed. David McGoldrick (Ipswich Town) right footed shot from outside the box is high and wide to the right. Assisted by Daryl Murphy. Attempt saved. Tom Smith (Huddersfield Town) right footed shot from long range on the right is saved in the top centre of the goal. Substitution, Ipswich Town. Jay Tabb replaces Luke Hyam because of an injury. Corner, Huddersfield Town. Conceded by Dean Gerken. Attempt missed. Sean Scannell (Huddersfield Town) left footed shot from the left side of the box misses to the right. Assisted by Oliver Norwood. Substitution, Huddersfield Town. Sean Scannell replaces Daniel Ward. Attempt missed. 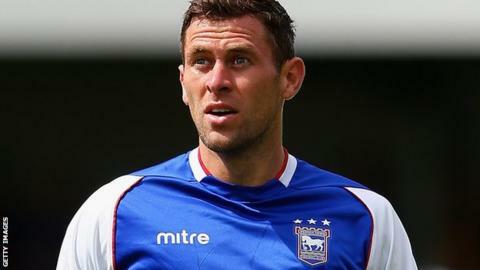 Daryl Murphy (Ipswich Town) left footed shot from outside the box misses to the left. Assisted by Cole Skuse following a set piece situation. Attempt saved. Daniel Ward (Huddersfield Town) left footed shot from outside the box is saved in the centre of the goal.